Our desire is to be an alternative to the gory, devilish, or vulgar attractions. We want you to enjoy your experience without it causing you any tears or nightmares! 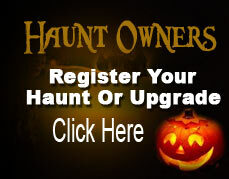 Our haunt focuses on creativity, startles, acting, & the WOW factor! Leaving with a laugh, smile, and occasional wet underwear makes for an all around good time! The hayride is only for ages 8 and older and the woods is only for ages 10 and older. Oct. 20th & 27th we open one hour early (6:00 pm). The Woods and Hayride are less spooky without the darkness. If your kids that are hesitant to do the attractions, then this is the time to test it. The woods is for children 10 and older. The hayride is recommended for ages 8 and up. Anyone under the age of 16 must have an adult with them for any of the attractions.